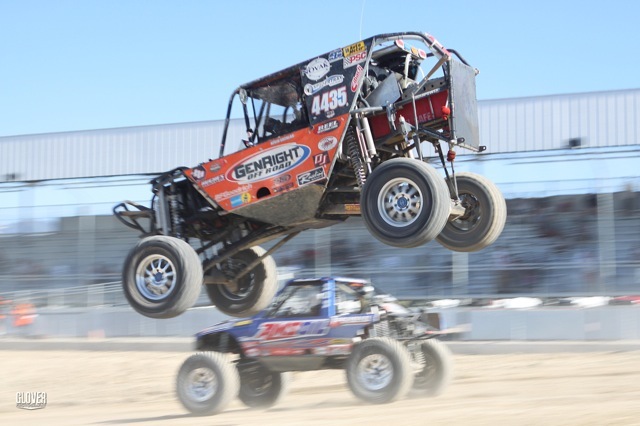 July 19, 2011 –Tooele, UT: Team GenRight’s Kevin Sacalas beat out this year’s King of The Hammers winner and current Ultra4 Series leader, Shannon Campbell to take the victory at the American Rocksports Challenge. The event took place at Miller Motorsports Park in Tooele, UT. The American Rocksports Challenge combines a rock-crawling obstacle course with a short course track. A total of 40 Ultra4 drivers raced against each other in a progression of 12 races that narrowed down the field to the top placing drivers. In the first race Kevin Sacalas came in 2nd place. A tire failure in the second event left Sacalas in 2nd to last place, which disqualified him from automatically advancing to the semi-finals. To earn a position in the semi-finals he was required to compete in the Last Chance Qualifier race. Even with his engine missing firing and down on horsepower Sacalas delivered a stellar performance. Taking 1st place, and sending him onto the semi-finals. With engine problems corrected, Sacalas went on to gain the lead in the semi-finals, and in one of the seasons biggest upsets, took 1st place. With a three second lead on the current Ultra4 Series leader Shannon Campbell who finished in 2nd place. RCV Performance Products is a division of Aircraft Gear Corporation, a family owned business conglomeration that has been in operation for over 60 years, and includes Rockford Constant Velocity – one of the largest manufacturers and distributors of CV parts in the Western Hemisphere. In addition to offering the most complete line of American-made products, the corporation is also a prominent supplier of rear driveline components. RCV Performance Products specializes in the manufacture and distribution of patented off road CV axle conversions and IFS CV upgrades for vehicle makes including Chevrolet, Dodge, Ford, Hummer, Jeep and Toyota. RCV also specializes in applications for custom builds. RCV Ultimate CV Axles are used by championship winning Off Road racing teams. For more information visit www.rcvperformance.com.